15 Years After East Timor Massacre, Calls for Accountability Continue | Democracy Now! John Miller, National Coordinator of the East Timor and Indonesia Action Network. Shirley Shackleton, her husband Greg was killed thirty-one years ago while on assignment in East Timor–investigating Indonesian military attacks. Send * email* to Shirley. AMY GOODMAN: As we mark the 15th anniversary of the massacre in East Timor, I’m joined by John Miller, the national coordinator of the East Timor and Indonesia Action Network, and Shirley Shackleton. Her husband Greg was, 31 years ago, killed in East Timor. He was reporting for Australian television with his team. And we welcome you both to Democracy Now! John, what kind of accountability for the massacre in Timor, where more than 270 Timorese were killed on November 12, 1991? JOHN MILLER: There’s been very little. Due to international pressure, there were a few prosecutions of low-level Indonesian officers. One senior officer was sent to the US to study, as his punishment, and people may remember. And there was a lawsuit, and he was found liable. But this massacre and the countless others that have taken place since Indonesia first invaded in 1975, none of the senior military figures, none of the senior political figures have been brought to court. AMY GOODMAN: The report that went to the UN? JOHN MILLER: The East Timorese initiated, under the UN administration — had a Truth and Reconciliation Commission, which did a very thorough history of what went on in East Timor during the occupation, came out with very strong recommendations, which have been ignored. And we’re trying to draw attention to them, that would call for accountability, for an international tribunal to bring these perpetrators to court. AMY GOODMAN: Shirley Shackleton, you lost your husband in October of ’75, about a month and a half before Indonesia invaded East Timor, in ’75. AMY GOODMAN: Greg was reporting for Australian television? SHIRLEY SHACKLETON: He and his team, five of them, went to Balibo, because they knew that this is where the hit-and-run attacks had been taking place for a year. They were denied by the Indonesians. The Timorese kept asking for people to come and see for themselves. They went there just simply to do their job. But when they caught the Indonesians, they were murdered out of hand. AMY GOODMAN: I want to go to the last report that your husband did. AMY GOODMAN: Greg Shackleton, in October of 1975 in Balibo. My main answer was that Australia would not send forces here. That’s impossible. However, I said, we could ask that Australia raise this fighting at the United Nations. That was possible. At that, the second in charge rose to his feet. He exclaimed, “Camerado journalist!” shook my hand. The rest shook my hand. And we were applauded, because we are Australians. That’s all they want, for the United Nations to care about what is happening here. AMY GOODMAN: And that was Greg Shackleton. He ended by saying he was reporting from a place he would not forget in Timor. And it was a report that Australians would never forget, because he and his crew were executed by the Indonesian military. SHIRLEY SHACKLETON: Well, I don’t use the word “executed.” It suggests that there was some sort of formal trial. They were just shot. These guys were cowboys. I mean, they were dressed as civilians. They just walked through into the village. The journalists came out with their hands up, and they just shot them. They kept a couple and tortured them, I believe. But we haven’t any real evidence, but there’s a lot of eyewitnesses who have assured us that that is what happened. AMY GOODMAN: Greg’s mother committed suicide a few years later? SHIRLEY SHACKLETON: She did. She did, yes, not because of the murders, but because the Australian government did absolutely nothing and, I would have to say, still have really done nothing of any value. AMY GOODMAN: Although later, they signed the Timor Gap Treaty, dividing up Timor’s oil between Australia and Indonesia. Perhaps that was one of the motivations for not criticizing Indonesia. SHIRLEY SHACKLETON: Oh, a lot of it. Yeah, they’re only interested in market shares. As all Western documentaries are interested in market share in Indonesia, they don’t care what happens anywhere else. AMY GOODMAN: 200,000 Timorese died over the next quarter of a century. John Miller, on this report, what role has the US played in the issue of accountability? AMY GOODMAN: 90% of the weapons used in the invasion were from the United States. JOHN MILLER: Right. That they should pay reparations to the Timorese and that these countries — and Australia and the US are now stepping up their military assistance in the name of countering the war on — prosecuting the war on terror — that governments not supply Indonesia with weapons and training until the military is totally reformed and until it proves it can respect human rights. And one way to show that it respects human rights is to let its generals and former generals be tried for the war crimes they committed in East Timor. AMY GOODMAN: President Bush is visiting Indonesia. JOHN MILLER: Right. He’s making a second visit this month, after he goes to the APEC conference. And we’re going to be pressing him not to offer more weapons and training when he goes there. AMY GOODMAN: Protest planned by Indonesians there? JOHN MILLER: Yeah, I think they already have started. A garden, historic garden is being destroyed in Bogar, where the meetings are going to take place, to accommodate his helicopter. And it will be one of these very — like his last visit, a very quick one. I think it’s only supposed to last eight or ten hours. 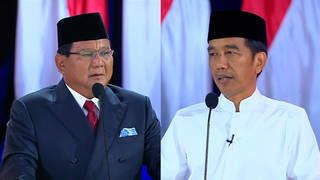 And it will be another way for the US to signal to Indonesia that business as usual has come again and that the US fully backs the Indonesian government and the Indonesian military. AMY GOODMAN: Do you ever see an international war crimes tribunal or a Timor war crimes tribunal taking place as a result of the 200,000 people being killed? JOHN MILLER: It will take time. The Timorese government is very afraid to press for this, because they need good relations with Indonesia. Indonesia has shown what kind of damage it can do to East Timor if it wants. But the East Timorese people continue to want it. And I think recent events, the recent crisis in East Timor shows why it’s necessary to enable the East Timorese to have some kind of closure and put the past behind them. And I think the Indonesians need it. And I think our own country needs it, as well. AMY GOODMAN: Shirley Shackleton, we’ll end with you. Though it was your husband that was killed in 1975, you took up the cause of all of the Timorese and have become in Australia a well-known East Timor activist. Do you feel that people understand what took place? SHIRLEY SHACKLETON: No, not really, because millions of rupiah have been spent to lies, to make it look as though Indonesia had to do what they had to do. Nevertheless, you just keep trying. You just mustn’t give up. I have to say that on the day that that INTAFET went in — that was, the Australian military went in — people that I knew had actively criticized me, they just rushed me when I went down the street to the grocery shop. I have people giving me flowers and kissing me. I mean, they completely changed their view. It shows if you start to win, you’re a winner. It was extraordinary. And I think the fact that so many hundreds of thousands of people got out on the streets demanding that Australia go in, it shows that all those years they knew that what we were saying was right. They can prove it. SHIRLEY SHACKLETON: Yunus Yosfiah. Yes? AMY GOODMAN: His position in Indonesia? He became the Minister of Information. SHIRLEY SHACKLETON: Oh, he got promoted. He’s the hero. He’s a very rich man now. AMY GOODMAN: We’re going to leave it there. Shirley Shackleton, her husband, Greg Shackleton, killed October 1975. John Miller, national coordinator of the East Timor and Indonesia Action Network. Tonight, we’ll be at Judson Church in New York at 7:00. Shirley Shackleton will be talking about her experiences. I’ll also be talking about the massacre in East Timor on this 15th anniversary.